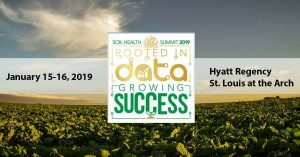 Hope you are heading to meet us in St. Louis this week for the latest soil health strategies, data insights and business impacts at the 2019 Soil Health Summit! The Soil Health Summit is a one-of-a-kind event, uniting U.S. farmers, agronomists, environmental groups, consumer companies and other partners like never before. Proudly hosted by the Soil Health Partnership, the Summit fosters making soil health research relevant to operational success, and facilitates discussion on the adoption of data-driven practices such as cover crops, reduced tillage and nutrient management on farms. Open to the public for the first time in 2019, the Summit is THE place to learn the latest in data surrounding adaptive management practices, engage in deep-dive education, and for farmers to connect with others in vital peer-to-peer networking and learning. This event provides great value in bridging the conversation between diverse stakeholders who rally around improving soil health. Two information-packed days begin with an opening luncheon on Tuesday, January 15, at the Hyatt Regency St. Louis at The Arch. Follow all the action with photos, audio presentations and interviews right here on the Summit Blog.